I got myself a new toy - a Thinkpad X1. I wasn't really sure whether I should get the X1 or a Macbook Air. The main reason I decided to get the Thinkpad is because I prefer Linux for coding and I actually prefer the style of the hardware. It looks like a hackers tool and not like a shiny fashion accessory, but that's of course just my taste. It's also a lot more powerful in terms of CPU and connectivity (RJ45 jack, HDMI out, USB3, built in 3G modem). The downside is the display, the IPS displays Apple uses are just SO much better. But hey, I'm a developer not a designer. This post describes the tweaks I did to make this notebook even better. They are also a documentation for myself. It targets advanced users. Everything works out of the box, but a few tweaks make it way more awesome. The default fan settings are very aggressive and result in a lot of noise. I use thinkfan for manual fan control. This reduces the noise significantly. Note that those are pretty extreme settings, use with caution and don't blame me. In order to improve battery life and to keep the device cool I tweaked some settings and disabled all unused devices in the bios. The changes save almost 10 watt! Also you should consider using flashblock for firefox/chrome. Flash will drain your battery. If you don't believe it just look at the cpu wakeups it creates using powertop. I use an Intel SSD in the Notebook. The installation was a bit fiddly but the performance is just incredible. The thing boots in seconds. In order to get TRIM support I added discard to the partition options in /etc/fstab. 802.11N seemed to create problems with my WLAN so I disabled it. 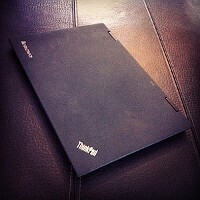 With all those tweaks done the Thinkpad X1 becomes a durable, light, quiet and fast notebook with a lousy screen.